This ultimate guide to the most notable historic sites in and around Washington is perfect for transit-oriented tourists and residents alike. Explore every museum, monument, mural and more—each within walking distance of a Metro station. 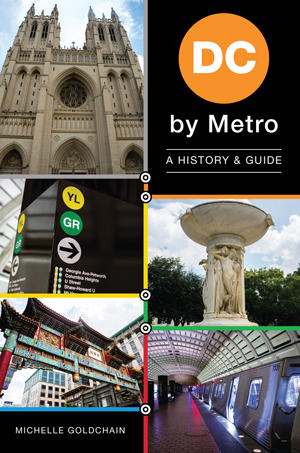 The Metro system covers more than 115 miles with ninety-one stations, allowing millions each year to easily access some of the area’s most beautiful, celebrated locations. Don’t miss President Lincoln’s Cottage in Petworth or the Friendship Archway in D.C.’s Chinatown. Learn the history of Wolf Trap and the story behind the Big Chair in Anacostia. Author Michelle Goldchain is your guide to the capital’s famous sites and best hidden attractions. Michelle Goldchain is a Washington, D.C.–born journalist, photographer, podcaster, artist and YouTuber. Her bylines have been seen in Washington City Paper, DCist, Curbed, Eater DC, Racked, Recode, Vox, Greater Greater Washington, DC Refined, Whurk Magazine and Tagg Magazine. For three and a half years, she worked as editor of Vox Media’s Curbed DC blog. Michelle holds a Bachelor of Arts degree in English with an art minor from Longwood University. To learn more about her, visit www.michellegoldchain.com.